The clever canines board the Tube each morning. After a hard day scavenging and begging on the streets, they hop back on the train and return to the suburbs where they spend the night. Experts studying the dogs say they even work together to make sure they get off at the right stop after learning to judge the length of time they need to spend on the train. The mutts choose the quietest carriages at the front and back of the train. They have also developed tactics to hustle humans into giving them more food on the streets of Moscow. Scientists believe the phenomenon began after the Soviet Union collapsed in the 1990s, and Russia's new capitalists moved industrial complexes from the city centre to the suburbs. Dr Andrei Poiarkov, of the Moscow Ecology and Evolution Institute, said: "These complexes were used by homeless dogs as shelters, so the dogs had to move together with their houses. 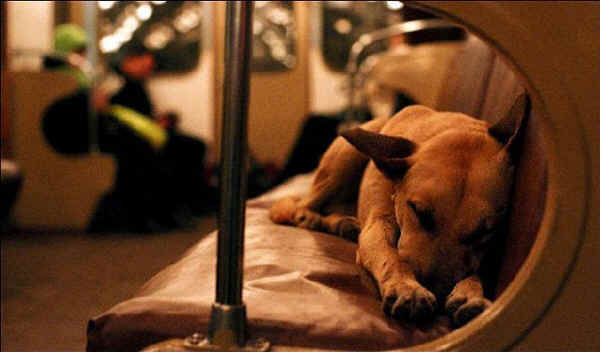 Because the best scavenging for food is in the city centre, the dogs had to learn how to travel on the subway to get to the centre in the morning, then back home in the evening, just like people." Dr. Poiarkov told how the dogs like to play during their daily commute. He said: "They jump on the train seconds before the doors shut, risking their tails getting jammed. They do it for fun. And sometimes they fall asleep and get off at the wrong stop." The dogs have learned to use traffic lights to cross the road safely, said Dr Poiarkov. And they use cunning tactics to obtain tasty morsels of shawarma, a kebab-like snack popular in Moscow. They sneak up behind people eating shawarmas then bark loudly to shock them into dropping their food. With children the dogs "play cute" by putting their heads on youngsters' knees and staring pleadingly into their eyes to win sympathy and scraps. Dr. Poiarkov added: "Dogs are surprisingly good psychologists." 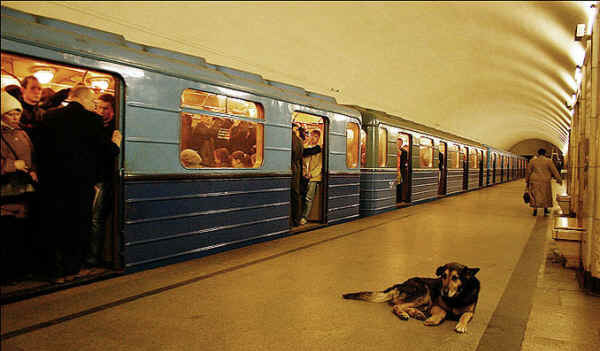 The Moscow mutts are not the first animals to use public transport. In 2006 a Jack Russell in Dunnington, North Yorks, began taking the bus to his local pub in search of sausages. And two years ago passengers in Wolverhampton were stunned when a white cat called Macavity started catching the 331 bus to a fish and chip shop.